In 1999, Romania, the country with the longest duration of the 11 August 1999 total solar eclipse, issued (for the first time ever in Europe) a polymer banknote to commemorate the event. The face value of the banknote (2000 lei) also celebrated the entering into the year 2000 (this is the reason for the surprisingly low face value of the banknote). The multicoloured banknote had many security features, including 2 transparent windows (one clear and one magenta). The banknote was taken out of circulation on 30 November 2004. This is a very rare banknote as from the very beginning it was printed in limited quantities. Are you interested in obtaining this very special banknote? Romania also uses polymer substrate for regular banknotes as well. 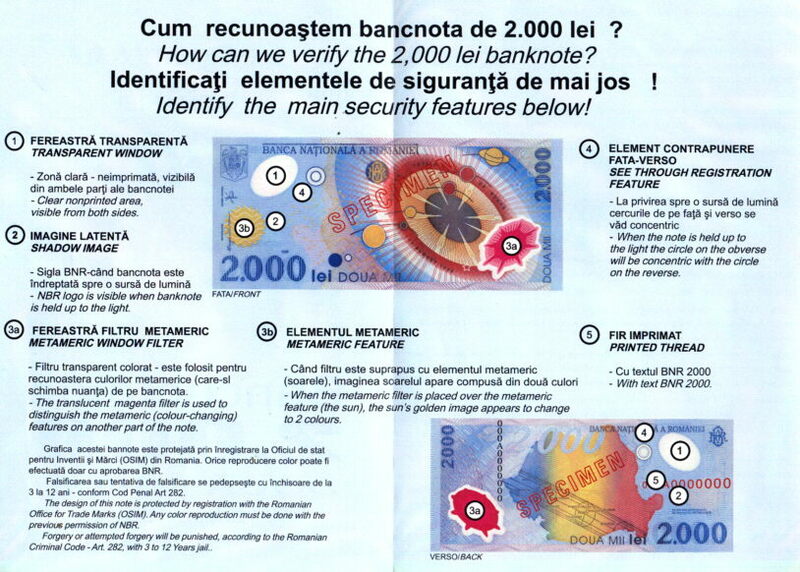 On 18 September 2000, the National Bank of Romania issued a polymer banknote with a face value of 10000 lei, followed on 23 October 2000 by a 500000 lei polymer banknote. The fourth Romanian polymer banknote (100000 lei) was put into circulation on 12 November 2001, followed on 14 December 2001 by the 50000 lei polymer banknote. Finally, on 5 December 2003 the 1000000 lei polymer banknote was issued. In 2004, the National Bank of Romania has decided a denomination of the national currency at the rate of 10000:1 (10000 old lei for 1 new leu), starting with 1 July 2005. Several new banknotes will be issued, all on polymer subtrate: 1 leu, 5 lei, 10 lei, 50 lei, 100 lei, 500 lei. The old polymer banknotes will be taken out of circulation on 31 December 2006. Thus Romania is the first – and for the moment the only – European country to issue regular and commemorative polymer banknotes. The links below are to pages containing different issues of Romanian banknotes. The images in these pages are for the personal viewing pleasure of the visitors. They should not be used for any other purpose.